Truly, madly and deeply, fellow snap enthusiasts, when I take photographs with my little Kodak instamatic from circa 1969, I like to see the full majesty of where I am, and that includes me out, way out of shot. I want to see what’s behind and beyond my own very familiar dial. After all, if one makes the effort to go somewhere, let’s see it, dudes, in all of its non-you glory. And why not use a mirror for your selfies, instead. You’ll save a small fortune on pixels. 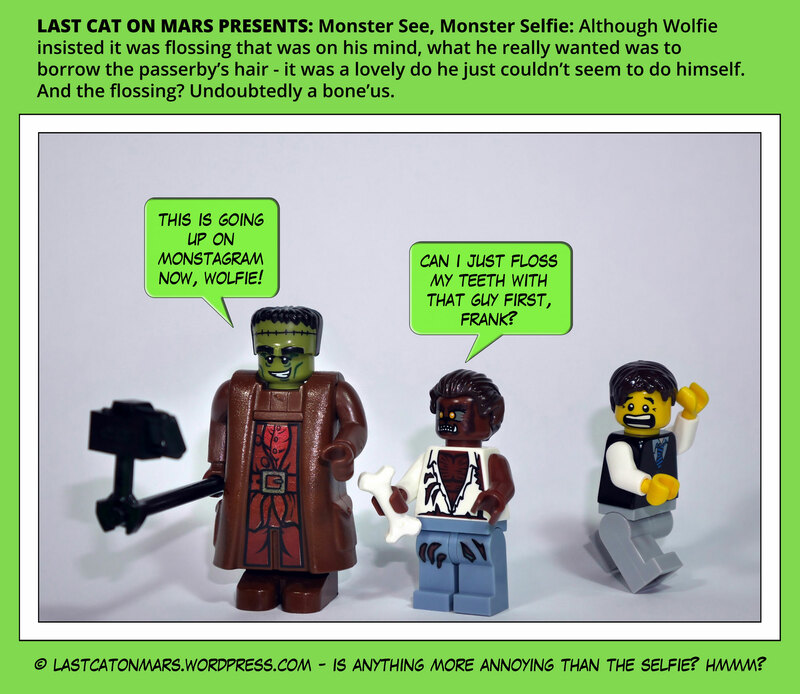 This entry was posted in Variety Show and tagged cartoon, comic, Frankenstein, minifigures, selfie, Werewolf on February 8, 2017 by Jay Verney. 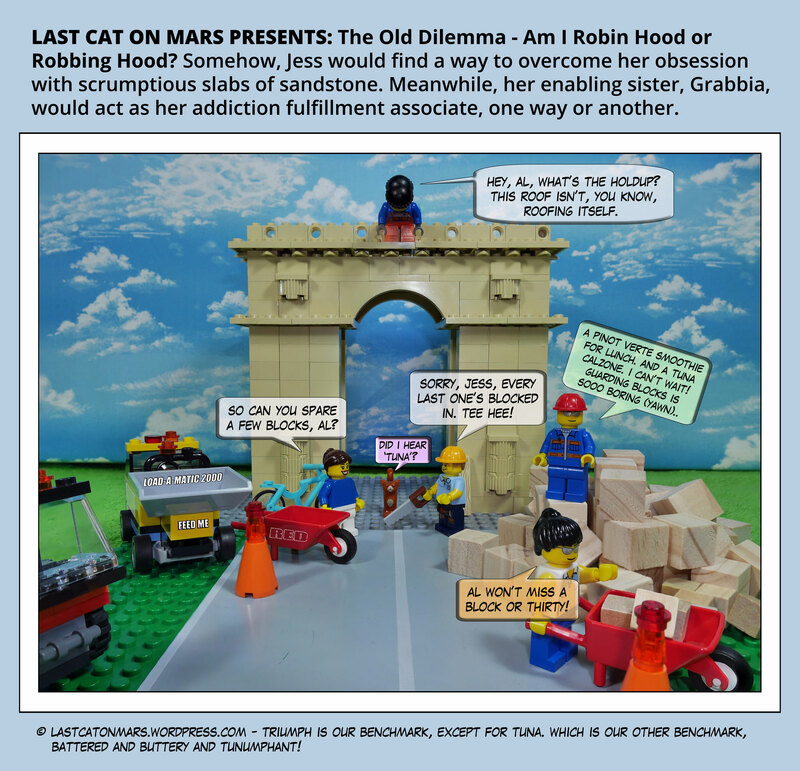 Last Cat On Mars Presents: The Old Dilemma – Am I Robin Hood or Robbing Hood? The thing about theft is that, as in a post-truth world, it’s all in the eye, or hand, of the beholder, or the be-stealer. One cat’s burglary is another cat’s night-time stroll around the neighborhood. I mean, just ask Cary Grant in To Catch A Thief. Was there ever a more handsome, urbane, lovely and gorgeous two-legged feline as Mr Grant? The answer is: there wasn’t, and Gracie knew it, too. In fact, do whatever you can to obtain a copy of the film so that you, too, can share in the joy of watching two thoroughbreds going through their paces. Not to mention Alfred’s involvement in the minor role of director. And while I’m at it, gather in Sabrina (the 1954 Billy Wilder version, the best and only one to watch), too, and make a rainy Saturday afternoon of it with Audrey Hepburn, Humphrey Bogart and William Holden. Now they were real movie stars, grasshopper, and don’t even get me started on Ava Gardner, Virginia Mayo, or Greer Garson. Or Errol Flynn, or Gary Cooper, or Randolph Scott. 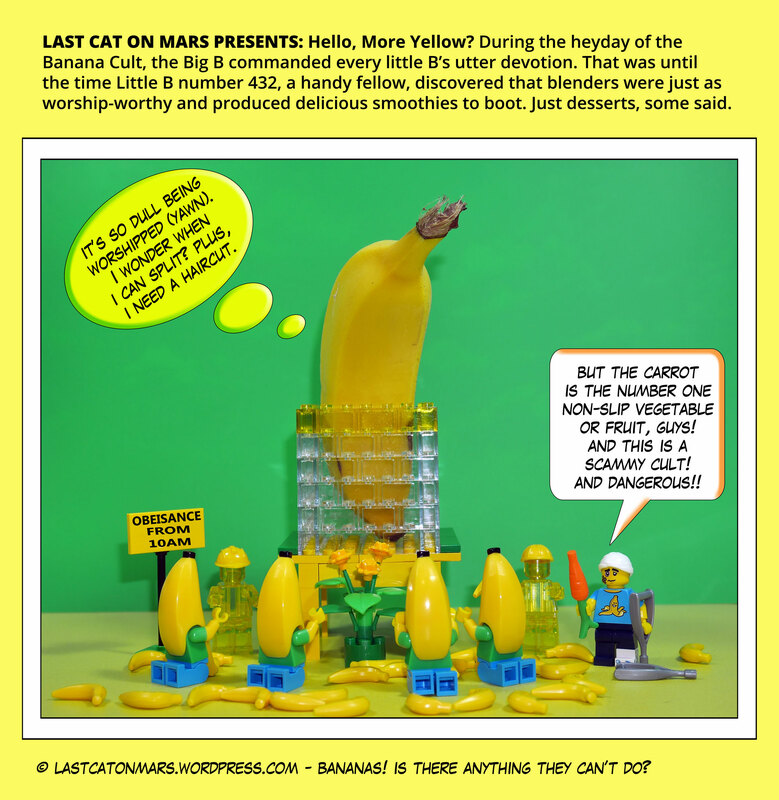 Just don’t – well, maybe another time, then. 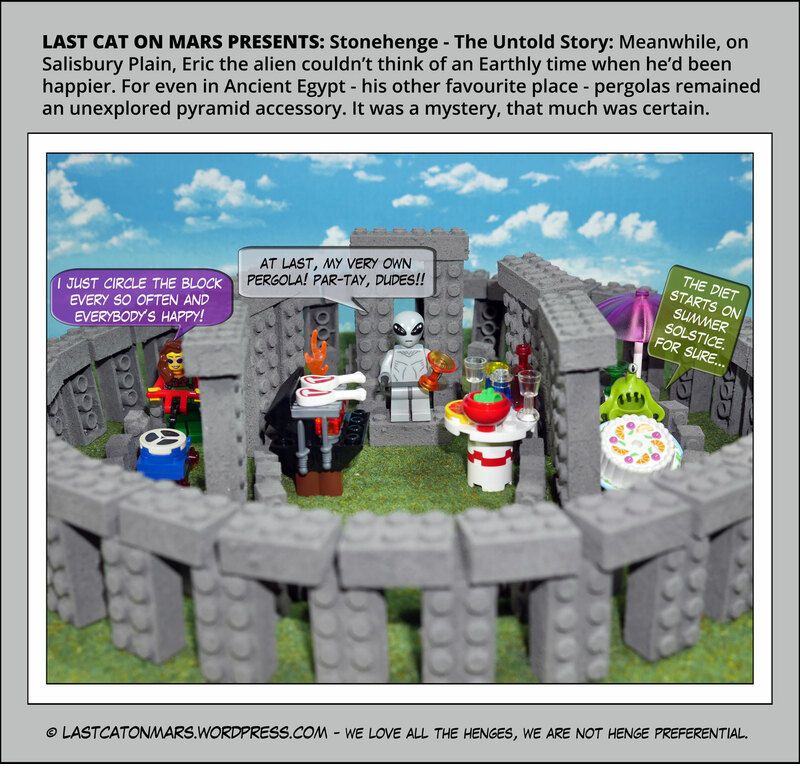 This entry was posted in Variety Show and tagged Arc De Triomphe, blocks, cartoons, comic, Dr on Mars, Last Cat On Mars, minifigures, wheelbarrow on February 1, 2017 by Jay Verney.